Different types of roses provide a range of possibilities to design gardens. The various types make it possible to introduce roses into almost any garden design . They also provide so much versatility that you can design a magnificent garden solely out of roses. Serious and dedicated rose lovers, those who collect the different species, usually have their roses in a separate part of the garden. Their rose gardens are specifically designed, where for example, they group colours together. The rose garden design should have the taller varieties are at the back. The medium varieties are placed in the middle and are not hidden by larger ones. The dwarf and smaller varieties are placed at the front. By planning the rose garden well, the long awaited magnificence of the spectacular blooms can be enjoyed to the fullest. Here is a wonderful idea for a rose garden. Enter the garden through an arch, covered with a creeping rose. Have a rose hedge surrounding the rose garden. This can link the whole design together. Place some of your favourite bush roses in a bed. Include a little paved area with a bench, for human comfort. Maybe add a few standard roses around the paved area, or next to the pathway leading from the arch to the bench. Stop, look, and smell the roses. Their delicate fragrances and visual appeal may just get you writing beautiful poems, stories and songs. If you decide to plant a rose hedge, prune your roses lightly. In order to form a hedge the roses must planted closer than usual. Choose the colors wisely. Depending on the design, the hedge should be the same colour. The Rugosa roses (Rosa rugosa) make good edges because they have a lot of foliage on them. You also get tall growing roses, which can make a rather tall hedge. Take a look at your local Nursery and see their rose variety. There are hundreds of species of roses. If you want to make a small, rather low hedge, try using a smaller variety. Rosa spinosissima altaica has creamy white flowers and grows to +- 1m. You can also get miniature rose species, which will form a small, compact hedge. Small medium and large rose shrubs, could look amazing in a maze (excuse the pun). Choose a hedge that will complement the overall rose garden design. A rose ground cover can also look lovely covering the bare ground of your rose garden. Ground covers keep the soil moist and suppress weeds. There are many varieties, i.e. Rugosa Regelina, and Bracteata McCartney. Albertine an evergreen rambler could make your rose garden design look less so bare. I have seen many formal rose gardens. Roses are particularly suitable for a formal design. I have seen a wide range of standard roses used in these gardens. They are tall and elegant and surely create a statement. They remind me of soldiers standing tall upright and at attention, guarding the beautiful garden. 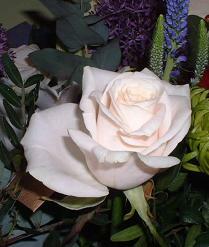 The roses that are selected to be standards are normally selected from the Floribunda group (hybrid tea group). They are normally about 80 cm tall. Then they still have a big rounded head (a lollypop). You can also get standards in the weeping form. Review the requirements of a formal garden design to assist you in applying the correct principles. These roses have a species flower with 5 petals. You can also get double flowers on the stems. The species roses have lovely ferny foliage which adds to the beauty of the roses. Miniature roses have flowers that 2 to 4 cm across. They flower throughout the rose season. They reach a height of 25 to 45 cm and have few thorns on them. Popular varieties include Colibri which has apricot to copper orange blooms, and Scarlet gem which has double scarlet flowers. The “old roses” normally flower in late spring and early summer. They have a beautiful fragrance. They include species such as Portland, Provence, dwarf Polyanthas and Bourbons. Some specialist nurseries still stock these “old roses”. There is much historic interest still attached to them. They have more petals than the species roses. They were very popular roses until the hybrid tea roses were introduced. These are the successors to the hybrid perpetuals of the old rose. They produce flowers freely, and they are richly scented. The flowers measure 10 to 15 cm across and have high pointed centres. Hybrid teas are excellent for cutting. Popular varieties include, Papa Meiland, Peace and Peter Frankenfeld. There are several species of these roses. They have single flowers that bloom in spring. Some species are vigorous climbers and climb up everything in their path. Less vigorous climbers are good to plant over arches. There they can be lightly pruned and trained. Some species include Cocktail, Blossomtime and Looping. Rambles have supple stems and creep up pergolas. They are sometimes prone to mildew. They flower in late spring. Some varieties include Albertine, Excelsa and Dorothy Perkins. Want to learn more about Rose Gardening?